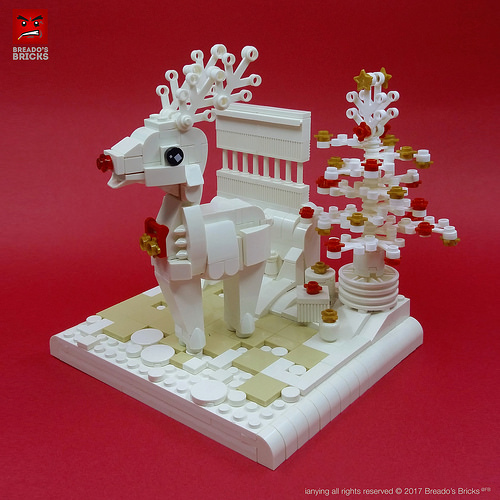 With its smattering of red and gold, this predominantly white LEGO scene by ianying616 makes a sweet and simple festive treat. The tree in the background is nicely-done, with just enough decorations to avoid looking stark. And I like the use of tan tiles amidst the restrained colour scheme — it gives a bit of contrast which allows the central reindeer to stand out. The little creature itself is a cool model, with good use of toothed parts, tiles, and curves to provide texture and detail. 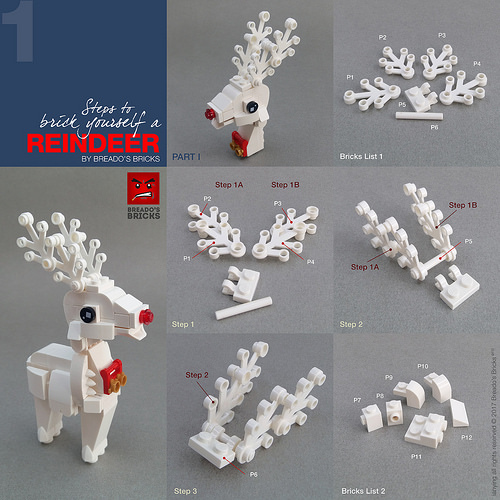 If you want to build your own festive white reindeer, ianying616 has kindly supplied instructions,. The first page is shown below. There are eight pages in total, and can be found in ianying616’s reindeer instructions album.